More than 180 workers made redundant from clinical waste firm Healthcare Environmental Services have started legal action to recover wages. Three months after the Shotts-based company let all its staff go, workers have still not received their last month's pay, notice or holiday pay. Some were able to claim statutory redundancy from the UK government but many were forced to turn to food banks. The company director insists he is not liable for the wages of former staff. Thompsons Solicitors claim some could be entitled to up to five months' wages. It came as former staff are planning a demonstration outside the headquarters of HES on Friday afternoon. They are calling on owner Garry Pettigrew to "do the right thing" and pay owed wages. Partner David Martyn said: "The former employees of HES were dismissed without notice in December last year. "Some employees are owed up to five month's pay and have had to resort to food banks to support their families. The time has now come for us to begin formal legal proceedings to force the company to pay the money the workers are due." Q&A: What has happened at clinical waste firm HES? About 150 jobs were lost in Shotts at the end of last year after the company lost multi-million pound contracts with NHS Scotland and 17 trusts in England. 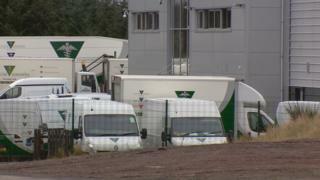 UK-wide, about 350 workers were affected. Contingency measures had to be put in place across the whole of NHS Scotland for clinical waste disposal. Labour MSP Monica Lennon has called on the Scottish government to withhold any further payments to the company for work carried out for the NHS and divert that to the staff. And Health Secretary Jeane Freeman has repeatedly called on Garry Pettigrew and the firm to meet their obligations. She told BBC Scotland: "They are due money for the period they were working that they have not received their wages for. "NHS Scotland has honoured its contractual obligations to his company to pay for services that were delivered. No more. "Therefore he should now honour his obligation to those he employed and pay people the money that they are due." But in a letter to Ms Freeman, Mr Pettigrew accused NHS Scotland of having "not paid outstanding invoices dating back as far as October 2018". He added that he was not personally liable for wages owed to former staff, and reiterated that he continued to have "no access to company funds". "The company is liable for wages, not the directors", he added. The directors, he said, "fought to maintain the business and the jobs for over 23 years, all without government support". "The directors remain determined to prove none of this fiasco is our doing and we will fight for the business and the staff to prove this injustice", he wrote. The company previously claimed that its reputation had been destroyed by the UK government. Speaking to the BBC in December, Mr Pettigrew blamed the government for lost contracts. He said: "The problem for finding a buyer is we are now a brand that the government has destroyed. "Long term, we have lost contracts that should never have been terminated." Monica Lennon wants to see funds diverted from HES to an account which can pay the staff what they are owed. She said: "It's a real injustice. These workers were cruelly let go just after Christmas. They've not received their wages. It's almost two months down the line and what's extraordinary is that health boards have continued to pay the company but workers haven't seen a penny of that. "It's just not fair and that is why I asked the first minister last week to intervene and do something about that. "The health boards have confirmed that they have continued to pay money to HES Ltd, even though they didn't deliver all the services that they were contracted to do. "They have confirmed there is around £450,000 still outstanding to be paid to the company. "It's only fair that some of that money goes to the workers for the work they carried out for the NHS." More than 20 former employees will line the gates of the plant to highlight the fact they still haven't received any money, despite the company still trading and receiving payments from the NHS.